For the past 24 years, KPCC has hosted an annual fundraiser known as the Jim Dent Dinner. Now in our 25th year, we bring you something new…. 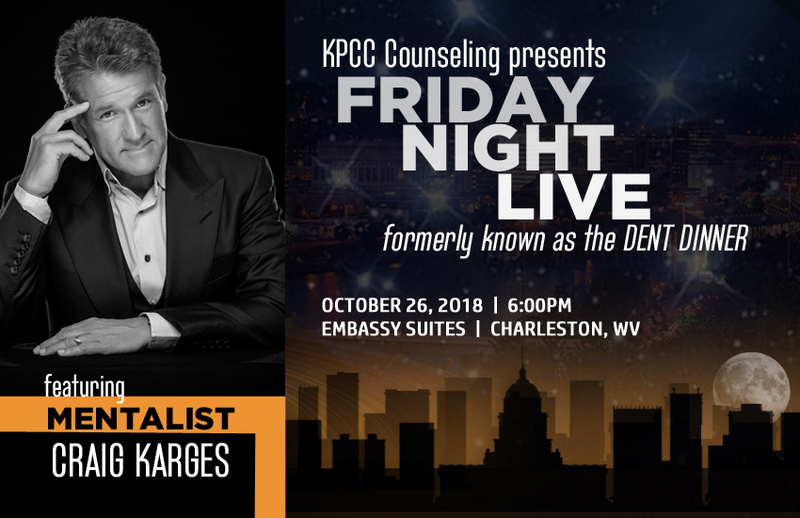 Mentalist Craig Karges is an award-winning entertainer, a nationally recognized speaker, and an author. Karges has made over five thousand appearances in 22 countries on four continents and in all fifty states. He combines the art of magic with the science of psychology and the power of intuition to create the impression that nothing is impossible. Fun fact about Craig – He’s a native West Virginian and proud graduate of Marshall University. When Craig isn’t out on the road blowing peoples’ minds, he lives in Wheeling, WV with his wife Charlotte. Proceeds from this event help provide fee subsidies for those in our community who cannot afford the cost of counseling services. We invite you to join us for an extraordinary evening of fun, mystery, mind reading, and illusion.